Similes and metaphors are types of figurative language used by authors in short stories and novels. 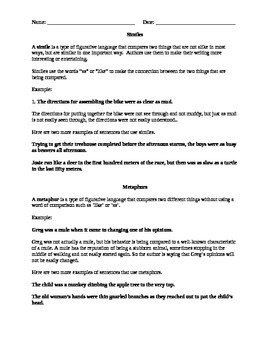 Understanding the meaning of both terms aids in reading comprehension. 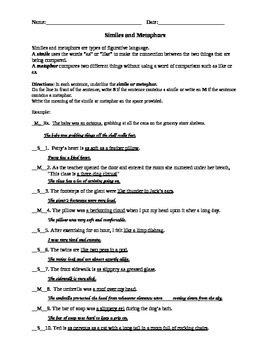 An explanation sheet of both terms, a worksheet which requires the student to identify similes and metaphors and their meanings, and an answer key is included. Learning About Similes and Metaphors is licensed under a Creative Commons Attribution-NonCommercial 3.0 Unported License.